- Injury report: For the Raptors, the injury report is clear. For the Nets, DeMarre Carroll (left knee soreness) is listed as questionable. Spencer Dinwiddie (torn ligaments in right thumb) and Jared Dudley (left hamstring strain) are listed as out. 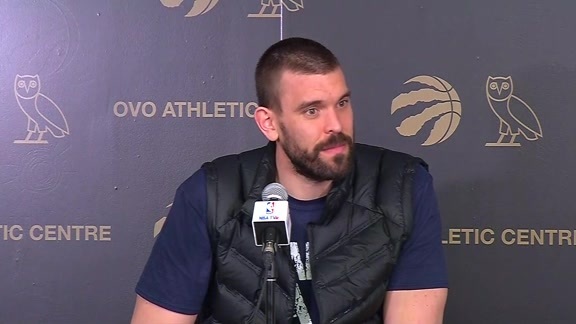 - Raptors debut: Marc Gasol made his Raptors debut at Madison Square Garden in Toronto’s 104-99 victory against the New York Knicks on Saturday. He had seven points, six rebounds, an assist, two steals and a blocked shot in 19 minutes off the bench. After Thursday's trade that brought Gasol to Toronto, he joined the team in New York prior to the game. Monday’s contest against the Nets will be Gasol’s Scotiabank Arena debut in a Raptors uniform. - Recent history: Monday’s game will be the third meeting between the Raptors and Nets this season, with each team winning a game on its home floor. In the most recent meeting, the Raptors defeated the Nets 122-105 at Scotiabank Arena on January 11 behind a 20-point, 11-rebound effort from Kawhi Leonard. 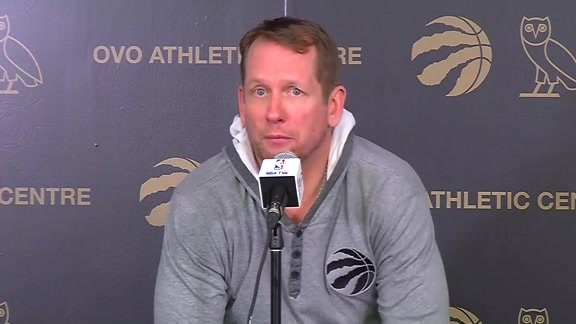 The Raptors had eight players reach double figures, and received 58 points from the bench reserves who were led by Norman Powell and OG Anunoby who each scored 13 points. D’Angelo Russell led the nets with 24 points in the loss. The Nets come to Toronto after a 125-106 loss against the Chicago Bulls. - Four straight: The Raptors enter Monday’s game on a four-game winning streak, looking to make it five straight victories. This is the fifth time this season that the team has won at least four straight, and Saturday’s win in New York moved the team to 41 wins, tying a franchise record for most victories prior to the All-Star Game. The Raptors were 41-16 entering the All-Star break last season. Monday’s game is also the first of six straight games the team will play at Scotiabank Arena, with the All-Star Game breaking up the six-game stretch. Toronto has the third best home record in the league (22-5), after Denver (23-4) and Milwaukee (23-5). - Feeding it: Kyle Lowry led the team against the Knicks, scoring a game-high 22 points in 34 minutes. He shot 6-for-10 from the floor, including 5-for-7 from beyond the arc and 5-for-6 from the free throw line. Lowry also added four rebounds, five assists, two steals and two blocked shots in the win. Over his past three games, Lowry is shooting 13-for-27 from the three-point line. - Power Serge: Serge Ibaka was back to business with another double-double on Saturday, finishing with 15 points and 13 rebounds in 29 minutes against the Knicks. Ibaka has posted a double-double in eight of his last nine games. He has also scored in double figures in 18 straight games, tying the second-longest streak of his career. Ibaka is averaging 16.0 points per game this season, second highest on the team after Kawhi Leonard's 26.9 point-per-game average.